2016 might be the year of VR headsets and all, but some people still enjoy looking at regular screens. 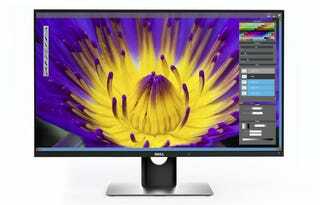 And the 30-inch, pro-level 4K OLED display Dell just announced looks like one hell of an upgrade. The Ultrasharp 30 is a big deal because it brings together two already-wonderful display technologies: eyewatering 4K 3840-by-2160 resolution, and the high-contrast, deep black world of organic light-emitting diodes (OLED). The end result is a screen that aces color-replication tests, and should look face-meltingly good, if you’re ever able to afford it. You’re getting more than just a good panel though: there’s a USB-C port on board, so you can supply power and video to your laptop with one cable. The new display is actually a bargain for 30-inch 4K panels: it’s only $5,000, whereas Sony’s equivalent runs $18,000. You’ve got a little time to go raid every piggy bank on the block, though, since launch is set for March 31st.